The lowdown: Craft beer sought to destroy it. They derided the style, mocking it as “fizzy yellow beer.” But credit where it’s due: Pilsner undeniably changed the beer world, and it’s still a tasty brew no matter who says otherwise (even craft brewers have come around in recent years). Pilsner was invented by accident. The beer-obsessed Czech Republic town of Pilsen built a new state-of-the-art brewery during the industrial revolution. In the 1840s, a man named Martin Stelzer oversaw the construction, drawing inspiration from the latest innovations of Bavarian breweries. He also recruited a Bavarian brewer named Josef Groll to the project. Legend has it the town expected Groll to brew a brown Bavarian lager, but the first batch came out golden and effervescent, with a creamy head of snow-white foam. In a time of thick, turbid beers, this refreshing brew from Pilsen was a revelation. 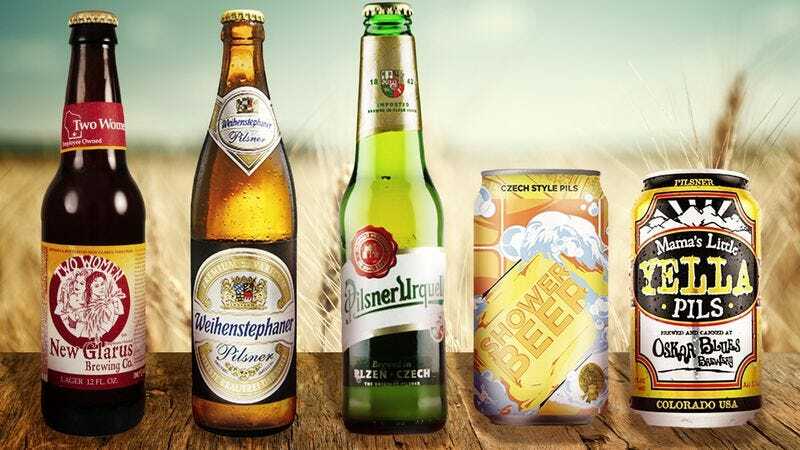 Bavarian ingredients coupled with the town’s soft water played a role in this miraculous drink, but the most essential difference may have been the new malting technology Stelzer installed in the brewery. At the time, most malts were produced by deeply roasting barley over wood fire. The resulting beer was dark and often opaque. When Stelzer set up the Pilsen brewery, his malthouse appears to have used a coke-fired kiln (coke is a porous, low-ash coal) to provide indirect heat, allowing the barley to malt without browning. This pale malt, brewed using Groll’s efficient method, converted more of the grain’s sugars into alcohol, leaving less swirling debris in the glass. The naturally soft water of Pilsen allowed flavors of the Bavarian hops to come through as well. It knocked the lederhosen off beer fans in the mid-19th century. A number of other serendipitous technological advances helped make Pilsen’s beer a sensation across Europe. First, the widespread availability of glassware made pilsner stand out. In a bar full of brown lager consumed in opaque earthenware, imagine the impression you’d make drinking a bubbly, golden beer you could actually see through. Next, distribution via train spread the beer across Europe in no time. Refrigeration allowed the cooler fermentation required for lagers without resorting to caves and cellars. Finally, Louis Pasteur made breakthroughs with his discoveries about yeasts’ property (also the stuff with vaccines, too), leading to more consistent brewing results—previously brewers largely relied on faith, habit, and luck for a good fermentation. Pilsner wore its consistency like a badge of honor, creating loyal drinkers everywhere it spread. Unfortunately, technological innovations didn’t stop there. Industrial brewers figured out how to cut more corners with ingredients and process when brewing pilsner-like golden lagers. By the 1970s that made light golden lager the most popular beer style in the world (think Budweiser, Coors, Miller, etc. ), though consistency was just about all it had in common with the original pilsners that started the craze. The taste: Today’s pilsners (or pils) are divided into Czech-style and German-style. Both share characteristics common of lagers: clean, straightforward taste that highlights grain and hops. The Czech-style follows the tradition created in Pilsen, showcasing the grassy, floral aroma of Saaz hops with a darker overall color (due to a longer boil in the brewing process). The German-style is based on the copycat versions of pilsner that sprung up as it grew in popularity in the late 19th century. The main difference is less allegiance to only using Saaz hops and mixing in other classic European hop varieties as well, resulting in a more bitter and earthy flavor. In general, the flavor of pilsners is reminiscent of bread. Possible gateway: The brewery that Martin Stelzer built in Pilsen was originally known as Citizens’ Brewery, reflecting the civic role it was meant to fill. That their core product became a sensation throughout the beer-drinking world seemed to catch them off guard. As evidence: “Pilsner beer” wasn’t even trademarked until more than 15 years after the product was introduced (and countless copycats were selling “pilsner” all over Europe). It wasn’t until 1898 that Citizens’ Brewery changed its name to Pilsner Urquell. They still produce much of the Pilsner Urquell consumed in the world, though they were bought by SABMiller in 2005 and may be sold to Japanese brewer Asahi as part of AB InBev’s takeover of SABMiller. Though fans were unhappy with changes in flavor they noticed in the early 2000s, most are happy now with the most traditional pilsner possible. Occasionally the brewery will send unpasteurized barrels around for promotional events—seek this out for the freshest and most aromatic pilsner possible. For an example of German-style pilsner, try Weihenstephaner Pilsner, from the German brewery that claims a lineage dating back to the year 725. It’s known for a more pronounced hop character than your average German-style pilsner. If you’re close to Wisconsin, try Two Women Lager, a German-style pilsner celebrating the alliance between two female-led businesses: New Glarus Brewing and Weyermann Malting of Bamberg, Germany, whose Floor Malted Bohemian Pilsner Malt takes center stage. If you’re not near Wisconsin, pick up Firestone Walker’s Pivo Pils for a craft-beer interpretation of this style. For the craft-beer interpretation of Czech-style pilsner, you can follow the advice of the friendly geeks over at BeerAdvocate, who’ve rated Moonlight Brewing’s Reality Czeck as the best of the bunch. Of course, Moonlight beers are only available on draft in California, so I’ve never tried it, though it sounds delicious (Lagunitas bought a 50 percent share of the brewery last year, so they may expand soon). If you dig the funny name but don’t live in California, check out Mama’s Little Yella Pils from Oskar Blues or Shower Beer from Champion Brewing in Virginia. We know you, like us, are always looking for a good shower beer. Next steps: You could seek out an imperial or double pilsner, which is what you think it is—a pilsner with stronger malt and hop flavors and a higher ABV to match (between 7-10 percent). The only problem is this trend is on the decline after peaking a few years ago. Still, The Bruery’s Humulus Lager is a respected example of this style. If you’re going deep with pilsners, why not make a vacation of it and travel to the original Pilsner Urquell brewery or visit Hill Farmstead in Vermont to try their top-rated German-style pilsner, Mary.